What better way to learn the history of a city than through its food? Bite San Diego hosts culinary walking tours to highlight historical points of interest of local San Diego neighborhoods in between stops to various local restaurants. Launched in 2011, the Downtown/Little Italy route was the company’s first venture and the tour covers interesting tidbits about the buildings, streets and humble beginnings of early San Diego. 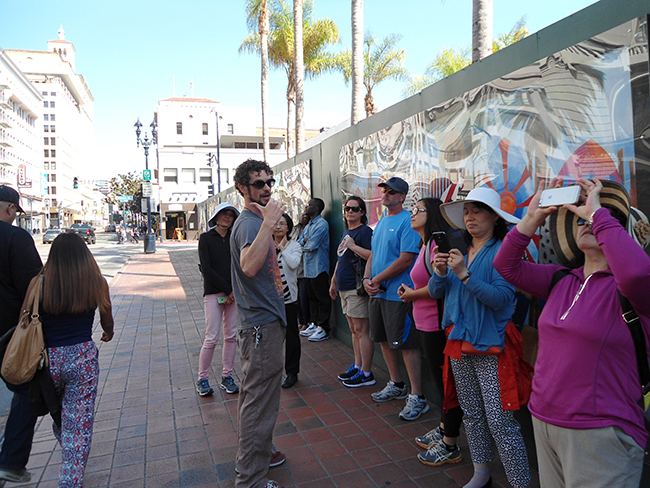 The local tour company has since expanded into other neighborhoods, and now offers walking tours in Hillcrest, Coronado, La Jolla, Encinitas and Pacific Beach, to name a few. The Downtown tour, offered on both Fridays and Saturdays, includes stops at five or six restaurants and usually sells out. The mostly flat route is approximately two miles long, starting in the Gaslamp Quarter and ending in Little Italy. It generally lasts four hours with up to 20 minutes between each stop. The route, historical tidbits, and included restaurant stops change often, so return trips are highly encouraged. Edward Deull has been a professional tour guide since 2007 and has been leading tours for Bite San Diego since its inception. He also conducts Segway tours for Another Side Of San Diego Tours, where he received thorough training about the area from their extensive research. Deull said he now culls most of his historical knowledge from the local history section of the new Downtown Central Library, as well as other tour guides. Pedicab drivers and other people who work Downtown often stop him to share additional historical tidbits after overhearing his spiel to tour groups. Bite San Diego stresses to participants that their tours are not meant to be a five-course meal, but rather bites and sips at each stop. Tours are capped at 15 participants, and the Downtown route is available to ages 16 and up. Other tours are designated 21 and up, due to requirements of some tour stop locations, though alcohol is not included in the price of the tour. It is available for purchase at most restaurant stops, however. Deull said about 60 percent of tour participants are San Diego residents, many from East County and North County. Deull tells historical anecdotes about various people and places from Downtown San Diego’s past, such as: Juan Rodriguez Cabrillo; Alonzo Horton; Wyatt Earp and the red-light Stingaree district; Horton Grand Hotel; Pocket Park and the William Heath Davis House; the namesake Gaslamp streetlights; the origins of the fishing industry in Little Italy; the 1915 Panama-California Exposition; Madame Cora’s Marble Room; Louis Bank of Commerce; The Keating Hotel; Hotel St. James; the Balboa Theatre; The US Grant Hotel; and much more. “One of the perks of this job is that I’m constantly reminded to not take San Diego for granted,” Deull said. Phoenix residents Chris and Laura Coughlin discovered Bite San Diego tours while searching for activities on Groupon.com. As frequent visitors to their second home in San Diego, they have now been on both the Bite La Jolla and Downtown/Little Italy tours. “We signed up for the La Jolla tour to try the different restaurants, but after we learned so much history on the first tour, that’s what we really wanted to come back for,” Laura said. “And we wanted the walk!” added Chris. The list of participating restaurants typically change a few times per year but are always located along the historical route, and are never so crowded that they can’t accommodate a large tour group. Current participating restaurants include Berkeley Pizza, Davanti Enoteca (Friday only), Magnolia Tap & Kitchen, Napizza, Royal India and Zymology 21. Participants assume responsibility for parking Downtown during the duration of the tour, but several pay lots are available nearby and public transportation via bus or trolley is also an option. Since the tour doesn’t end at the original meeting destination, many people arrange for alternative transportation or walk back on their own. Tickets for any of the tours are $45 per person and must be booked in advance at bitesandiego.com or by calling 619-634-8476. Private tours can also be arranged. For more information on neighborhoods, dates and reservations, visit their website or zerve.com/bitesandiego. —Kai Oliver-Kurtin is a local freelance reporter who also works full-time doing social media marketing for the U.S. Navy. She enjoys covering events, restaurant news, culture and entertainment. Contact her at kai.sdnews@gmail.com.